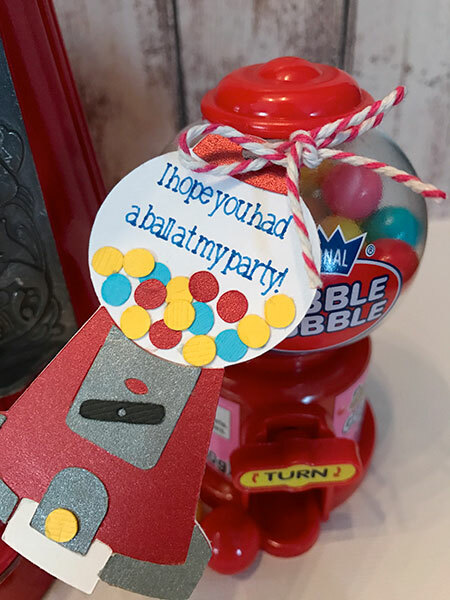 Gum Ball Party Favor Tag. Hi everyone, I'm Jess from Everyday Party Magazine! I am thrilled to be here today. I blog about parties, party DIY's, and recipes. I love sharing ways to host an amazing party, while staying on a budget. 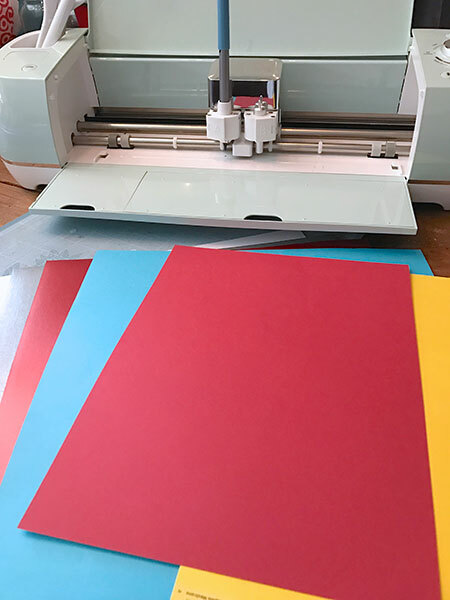 One of my favorite party tools is my Cricut Explore Air 2. I use it at least once a week. It is truly an invaluable tool. One of my boys just turned 13, and he's too cool for a real party, but, he, like me, believes any celebration requires a party favor. This boy also has a sweet tooth a mile long, and was crazy excited to text me a picture of the mini gum ball machines he saw at Cracker Barrel while skiing recently. I knew they would be great favors for his 13th birthday celebration. 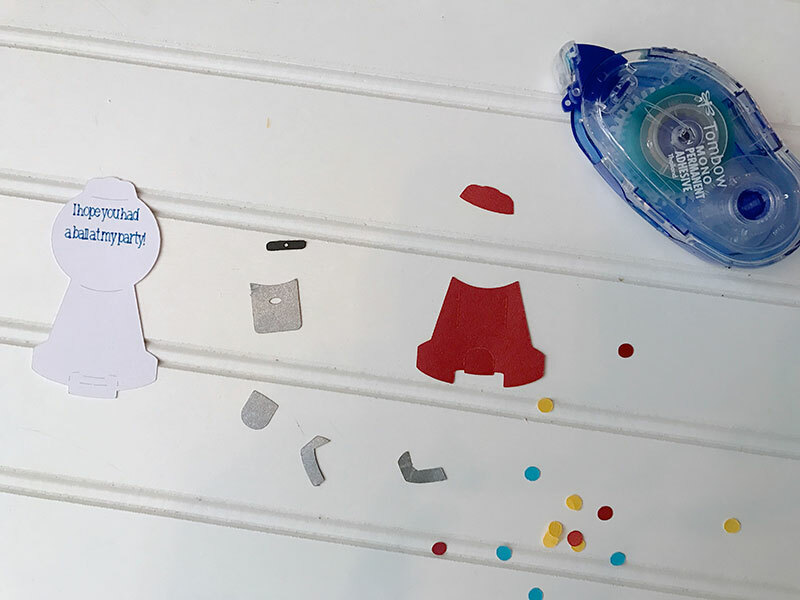 I ran to my local Cracker Barrel Old Country Stores and grabbed a few mini gum ball machines, and let them sit on my desk for weeks ... Until I saw the Wrap It Up Cartridge fro Cricut. There is an adorable gum ball machine cut file, and I knew it would be perfect for the mini gum ball machines. I sized the cut file down and changed the colors so it would fit the party favors. I also added some text to the gum ball machine globe. My son hated the text, so his just say, From Caden. Either way, it's a perfect place for text. The kids all helped add the tiny paper gum balls to the tag, and even though it was a little labor intensive, it wasn't difficult to make a dozen of them! I separated each tag into a pile, and assembled one at a time, I found that this helped reduce losing pieces. I layered the red on top of the white, then the silver and the black on top of the red. Once that was done, I passed it off to one of the boys to add gum balls. We used my Tombow tape runner, but you could use a glue stick or even a Xyron machine. Finally, I tied the tags onto the tiny gum ball machines with baker's twine. I think they are absolutely adorable! I hope you enjoy. 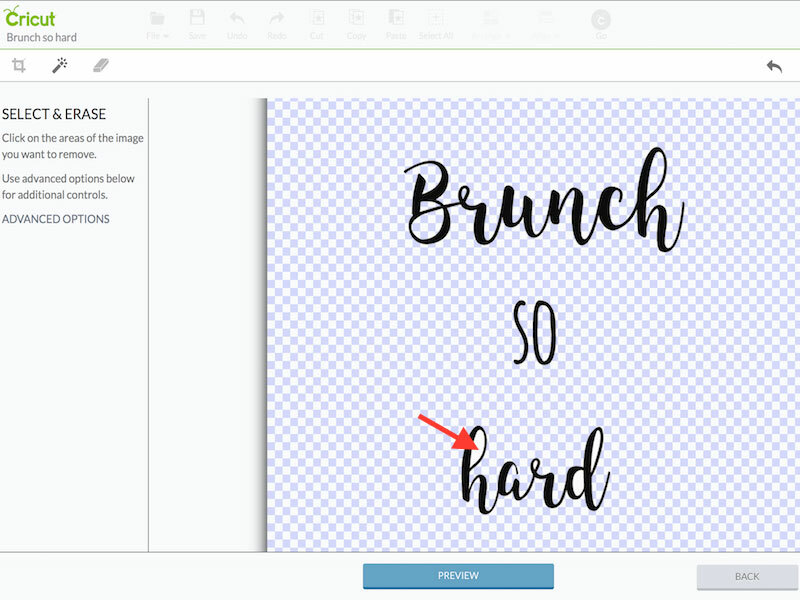 Here is the cut file so you can make it fast on Cricut Design Space. It looks awesome. I would love to do that for my grandson but with mickey mouse. 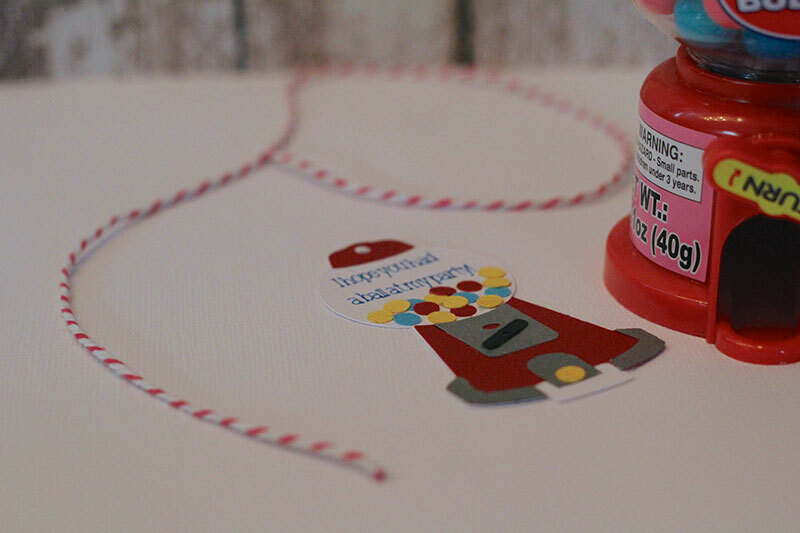 OMGosh so cute I love themes with gumball, I just need to get me my cricut air and I will be complete as far as my crafting goes…..
Hi! Where can I find the cut file for this? Thanks!